Phenol and phenyl are IUPAC names given for certain chemical compounds. Phenol is an aromatic molecule. It is the simplest aromatic alcohol that is composed of a benzene ring substituted with a hydroxyl group. Phenyl is the name given to a side group. It is composed of a benzene ring which is missing a hydrogen atom. The phenyl group can get attached to a vacant point as a side group of a molecule. 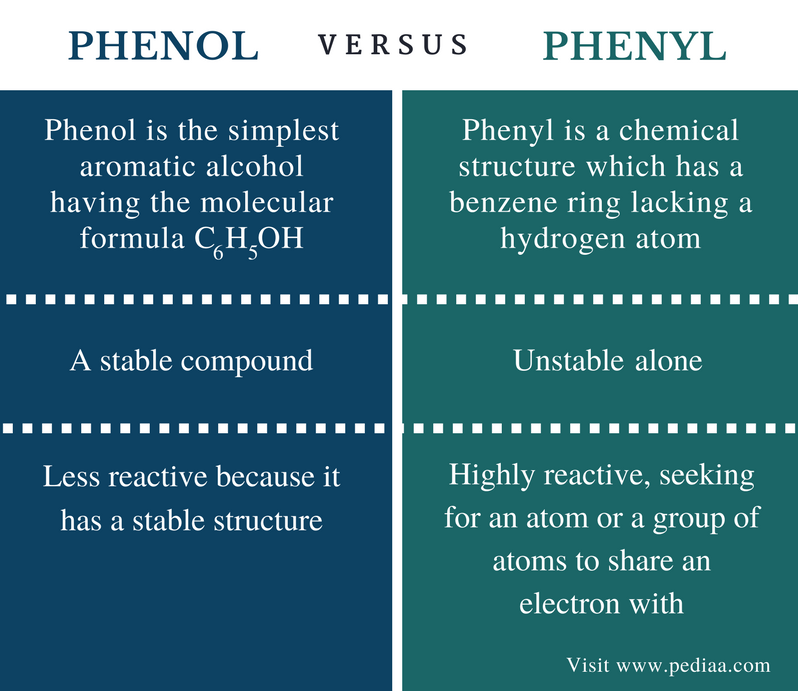 The main difference between phenol and phenyl is that phenol is composed of an oxygen atom whereas phenyl has no oxygen atoms. Phenol is the simplest aromatic alcohol having the molecular formula C6H5OH. The molar mass of phenol is about 94.11 g/mol. 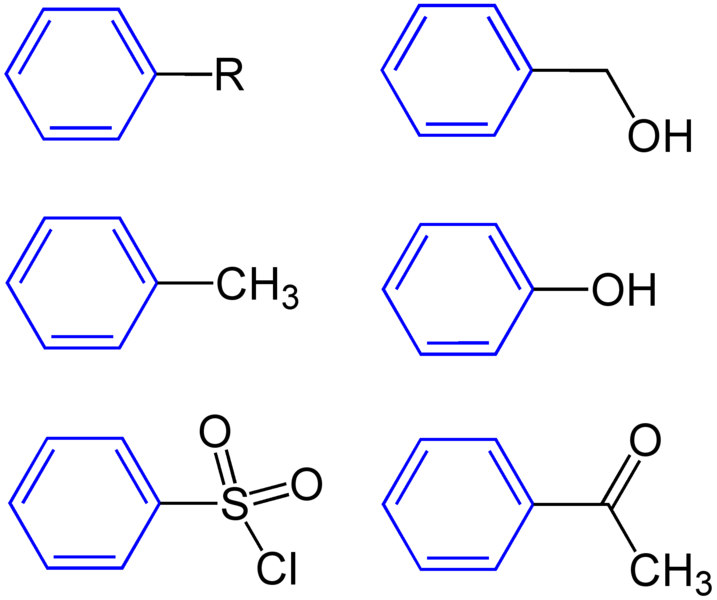 Phenol molecules are aromatic due to the presence of a benzene ring. This benzene ring is substituted with a hydroxyl group (-OH). In other words, a phenol molecule has a phenyl group attached to a hydroxyl group. Phenol is considered as a weak acid. In aqueous solutions, phenol partially dissociates into phenolate anion, forming a hydronium cation. But when compared to other alcohols, phenol is considerably acidic since the phenolate ion is stabilized by the delocalization of the negative charge through resonance. At room temperature and pressure, phenol is a transparent crystalline solid with a sweet odor. It is a volatile compound. The melting point is about 40.5 °C. The boiling point is about 181.7 °C. Phenol is miscible with water due to its ability to form hydrogen bonds with water molecules. Phenol is a toxic compound. Phenol and its vapors are corrosive to the eyes and the skin. However, phenol is very useful in industries. For example, it is a precursor for the production of plastics. Phenol is also commonly used as an antiseptic and disinfectant. Phenyl is the chemical structure which has a benzene ring lacking a hydrogen atom. Since it lacks a hydrogen atom, there is a vacant point for other atoms or molecules to get attached to the phenyl group. The chemical formula of phenyl is C6H5. The phenyl group is a cyclic structure which has a planar geometry. Here, five carbon atoms are bonded to five hydrogen atoms individually. The remaining carbon atom has no hydrogen atom bonded to it. Phenyl group is more stable when compared to the corresponding aliphatic alkyl group. This is due to the stabilization of the aromatic ring via delocalization of pi electrons. Phenyl group alone is not stable because the carbon atom has an incomplete electron configuration due to the lack of a hydrogen atom to share an electron. This makes phenyl group very reactive. It seeks for an electron to share with. Therefore, phenyl group will react with an electron-rich atom or group of atoms. Phenol: Phenol is the simplest aromatic alcohol having the molecular formula C6H5OH. Phenyl: Phenyl is a chemical structure which has a benzene ring lacking a hydrogen atom. Phenol: Phenol is a stable compound. Phenyl: Phenyl group alone is unstable. It is highly reactive. Phenol: The molecular formula of phenol is C6H5OH. Phenyl: The molecular formula of phenyl is C6H5. Phenol: Phenol is less reactive because it has a stable structure. Phenyl: Phenyl group is highly reactive, seeking for an atom or a group of atoms to share an electron with. Phenol and phenyl are often confusing terms due to their nearly similar spelling. However, these are different names given to different chemical compounds. 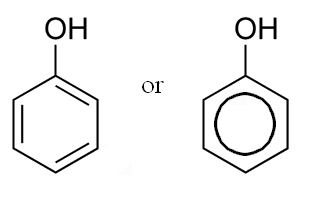 The main difference between phenol and phenyl is that phenol is composed of an oxygen atom whereas phenyl has no oxygen atoms. 1. Wade, Leroy G. “Phenol.” Encyclopædia Britannica, Encyclopædia Britannica, inc., 19 Apr. 2016, Available here. 2. “Phenol.” National Center for Biotechnology Information. PubChem Compound Database, U.S.National Library of Medicine, Available here. 3. “Phenyl group.” Wikipedia, Wikimedia Foundation, 8 Oct. 2017, Available here.